Have you ever been to an event and 5 minutes into it, you found yourself wondering “Could my day be spent doing something MORE productive?”. This happens way too often at events and the sad part is that the presenters have great information to share. Unfortunately, there is often a lack of attendee engagement. This leads to boredom, daydreaming and sometimes to people leaving the event early. The key to keeping your attendees in the room is not locking the door! The key to keeping your attendees on the edge of their seat is Engagement. 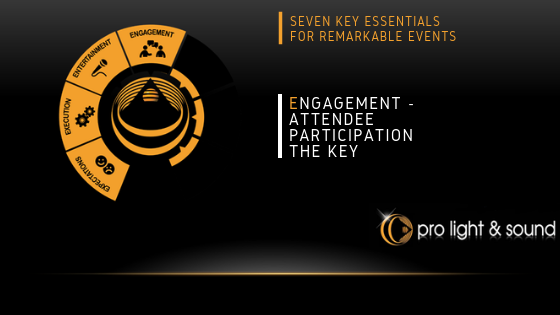 Audience Engagement is achieved through attendee participation! Whether it be a Sales Conference, Executive Seminar, Summit Meeting or Training Day, understanding how human beings absorb experiences is imperative to creating remarkable events. Break Times – people’s ability to retain information diminishes after approx. 25 minutes. Give people adequate breaks or change the structure and pace of the presentation every 25 minutes. Sensory Experience – The more senses you can engage the better. Think about sound, smell, sight, touch and even taste. This may be outside the box for some types of events but is highly effective when unexpected. Use music and lights to engage sight and sound. Ask people to interact with each other, give each other a high five to engage touch. Some events organisers even have a scent consultant create an original scent for their event. How can you be creative and engaging? Audience Participation – Create a dialogue. Encourage the attendees to talk to each other. Discuss the content, answer open questions, participate in activities, use their devices to ask questions or participate in questionnaires. Charisma and Humour – Make sure that the presenter and the MC are engaging. Knowing how to use tone and pitch of voice, effective pauses and expressive body language will create a greater connection. Using appropriate jokes is also a great way to get the attendees to engage and participate. Stand Up! – Get your audience out of their seat. Sitting for too long makes us restless. Implementing techniques that encourage the attendees to stand up and shake it out will ensure greater ongoing concentration. Interaction – Create a space or area that your audience can touch and feel your product or ask questions in a small group or face to face with hosts. Make this part meaningful to your message or brand. Emotional Connection – Have little “Wins” for your audience, this produces “Dopamine” which is a natural hormone in the system that excites and makes us happy. Emotion and experience are the keys to absorbing information. Whether it’s leaning in for a learning experience, interaction or rapt attention. Connection with the event, the presenter, the product or the guest of honour will get the best results. Create a sense of belonging or involvement to create a more meaningful connection. Ask for feedback in a personal manner. Get this right and your attendees will be calling for an encore. If you are looking for an event partner that knows how to create remarkable experiences, then Pro Light & Sound are your keys to success. With 30 years’ experience in the event industry. Across all types of events. We know how to create an audience experience that exceeds expectations and has everyone wanting more.